Heading into last weekend, it was virtually guaranteed that Guardians of the Galaxy Vol. 2 was taking the top spot at the box office, the only real question was how much it would earn. Early box office projections had the superhero sequel taking in as much as $160 million in its opening weekend, a huge jump from the $94.3 million that the original Guardians movie made. But the sequel fell just short of those projections, only taking in $146.5 million, just a bit more than the Sunday estimate of $145 million. This weekend, it will go up against two new releases, Warner Bros.' King Arthur: The Legend of the Sword and 20th Century Fox's Snatched, neither of which are expected to put up much of a fight against this Marvel Phase Three adventure, which should easily repeat with $79.2 million. Box Office Mojo reports that the PG-13 fantasy adventure King Arthur: Legend of the Sword will open in approximately 3,600 theaters this weekend, while the R-rated comedy Snatched arrives in roughly 3,300 theaters. 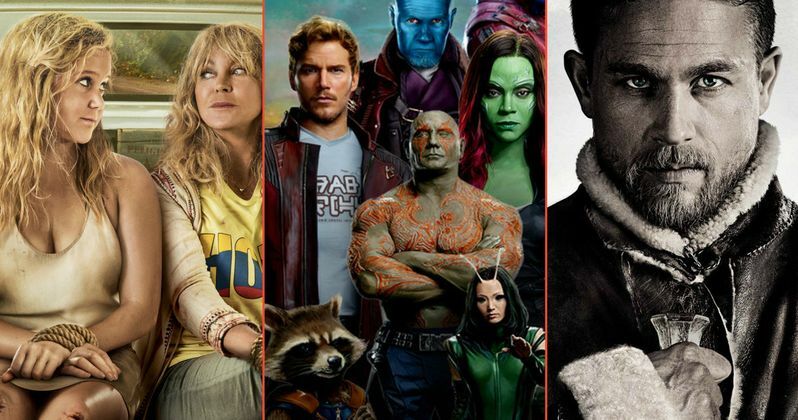 While both movies offer unique counter-programming opportunities that will lure different types of audiences to theaters, none will likely be able to take down the Guardians of the Galaxy sequel. We're predicting that King Arthur: Legend of the Sword will debut in a distant second place with $27.4 million, with Snatched following in third place with $16.3 million. The top five will most likely be rounded out by The Fate of the Furious ($5.7 million) and The Boss Baby ($4.1 million). As of now, Guardians of the Galaxy 2 will be the movie to beat this summer, which has also fared quite well internationally. The movie has earned $285 million since its international debut two weeks ago, for a worldwide total of $431.5 million. This included an impressive debut in China of $49.5 million. Much like the domestic debut, the superhero sequel saw a big increase in China from its predecessor, which opened at $30 million en route to $86.3 million, which was easily the highest-grossing international market for the movie. While Guardians 2's box office run is just starting, it will seemingly have no trouble surpassing the $333.1 million domestic mark and $773.3 worldwide mark of the original. Acclaimed filmmaker Guy Ritchie brings his dynamic style to the epic fantasy action adventure King Arthur: Legend of the Sword. Starring Charlie Hunnam in the title role, the film is an iconoclastic take on the classic Excalibur myth, tracing Arthur's journey from the streets to the throne. When the child Arthur's father is murdered, Vortigern (Jude Law), Arthur's uncle, seizes the crown. Robbed of his birthright and with no idea who he truly is, Arthur comes up the hard way in the back alleys of the city. But once he pulls the sword from the stone, his life is turned upside down and he is forced to acknowledge his true legacy...whether he likes it or not. Starring with Hunnam (FX's Sons of Anarchy) and Oscar nominee Law (Cold Mountain, The Talented Mr. Ripley) are Astrid Bergès-Frisbey (Pirates of the Caribbean: On Stranger Tides) as Mage; Oscar nominee Djimon Hounsou (Blood Diamond, In America) as Bedivere; Aidan Gillen (HBO's Game of Thrones) as Goosefat Bill; and Eric Bana (Star Trek) as Arthur's father, King Uther Pendragon. Dumped by her boyfriend on the eve of their vacation, impetuous dreamer Emily Middleton (Amy Schumer) persuades her cautious mother, Linda (Goldie Hawn), to accompany her on an exotic getaway to South America in Snatched. Polar opposites, Emily and Linda must soon work through their differences to escape from a wildly outrageous and dangerous jungle adventure. The supporting cast includes Ike Barinkholtz, Christopher Meloni, Randall Park, Wanda Sykes, Oscar Jaeneda, Colin Quinn and Kevin Kane. The top 10 will be rounded out by How to Be a Latin Lover ($2.8 million), Beauty and the Beast ($4.9 million), The Circle ($4 million), Baahubali: The Conclusion ($3.2 million) and Gifted ($2 million). Also opening in limited release is Blumhouse Tilt rolls out Lowriders, which opens in roughly 275 theaters, Atlas Distribution's Absolutely Anything, Vladar Company's Generation Iron 2, Sony Pictures Classics comedy Paris Can Wait, First Run's documentary Stefan Zweig: Farewell to Europe, Roadside Attracions' thriller The Wall and their romantic comedy The Wedding Plan and Arrow Films' Whiskey Galore. It remains to be seen if any of these films will expand in the weeks ahead. Looking ahead to next weekend, 20th Century Fox's Alien: Covenant will likely present the biggest threat to Guardians 2 yet, opening alongside the 20th Century Fox family comedy Diary of a Wimpy Kid: The Long Haul and Warner Bros. teen drama Everything, Everything. Also opening in limited release is IFC's Wakefield and ArtEffects' Champion. Take a look at our projections for the weekend of May 12, and check back on Sunday for the box office estimates.